Staying organized and keeping track of invoices, payments, receipts, and other day-to-day documents is the foundation for a successful business. 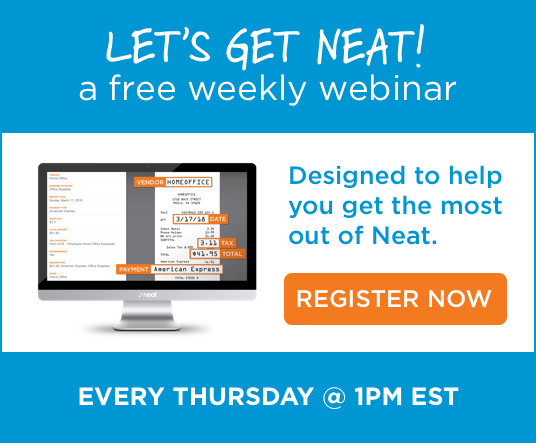 Neat takes the manual data entry out of your workflow and keeps all your important documents in one easily accessible location. Neat’s powerful InDocument Identification Technology™ (ID2) automatically captures and parses the key accounting-related information such as vendor, total, date, and more. Filter your information by category, date, amount range, vendor, project and more, providing real-time insights to your business. Secure Cloud Storage – Bank-level secure cloud storage on AWS. You didn’t start a small business to follow your dreams of becoming a bookkeeper! All small business owners must utilize quality accounting and bookkeeping practices in order for their business to survive and grow. Neat is a pre-accounting solution that will ease the burden of capturing and organizing the information needed to drive accounting and bookkeeping. It’s vital tool and first step in the process to get your books in order.